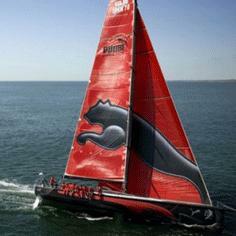 France’s Groupama were neck and neck with Spanish team Telefonica as the Volvo Ocean Race fleet sailed into the South China Sea on Tuesday, after Puma suffered yet another setback when they were snagged by a fishing net. Puma, the US-based team who lost their mast on Leg 1, had a shuddering blow last week when they rammed into a tree trunk and they were given another costly scare by their close encounter with a submerged net. The team lost over an hour as they cut themselves free on the way out of the Malacca Strait, which provided a real test as the crews tried to pick their way through hundreds of huge commercial ships and tiny fishing boats. At 10:00 GMT on Tuesday, Puma were around 10 nautical miles behind the leaders on the run from the Maldives to Sanya in China after what Amory Ross on board the boat described as the latest "gut-wrenching" setback. Telefonica, the overall race leaders, were just 0.6 nautical miles ahead of Groupama, who have been clinging to them ever since the boats entered the Strait. "Groupama are way too close for our liking," said Telefonica’s Australian navigator Andrew Cape. "It’s going to be tight with Groupama all the way to the finish now. They’re impossible to get rid of and they have a very good team." The teams are likely to hit boat-breaking conditions in the South China Sea over the next 24 hours, with the same sort of strong winds and huge waves that led to Abu Dhabi and Sanya limping out within the first 24 hours of Leg 1 back in November. Abu Dhabi and Camper are around 30 miles behind the leaders, who should arrive in Sanya on February 4, assuming they survive the next 24 hours. Sanya are over 150 miles behind in sixth and have little chance of coming into their home port in anything better than last place. The 39,000 nm (72,000 km) race finishes in Galway, Ireland in July. Overall standings: 1. Telefonica (Spain) 71 points; 2. Camper (Spain/New Zealand) 64; 3. Groupama (France) 51; 4. Puma (USA) 36; 5. Abu Dhabi (UAE.) 31; 6. Sanya (China) 11.